Three reporters covering a mass wedding in Gaza City were brutally beaten by Hamas security forces. Three reporters were attacked by Hamas security forces while covering a mass wedding in Gaza City on Thursday. Reports identified the three as local Sky News reporter Mohammad al-Mashharawi, BBC reporter Adnan al-Dorosh and Amer Abu Omar, a Gaza-based journalist. Witnesses told the Bethleham-based Maan News Agency that the the three were severely beaten in a nearby playground. The Palestine News Network said that al-Mashharawi was detained by Hamas and that his location is currently unknown. 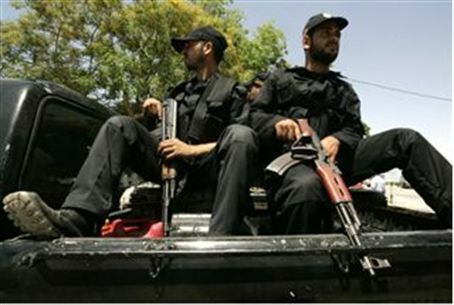 Gaza's Ministry of Interior issued a statement shortly after the incident condemning the attack. Officials said they would "open an investigation and punish the assailants." Local human rights activists say Hamas has increasingly targeted journalists in Gaza for violence over the past year.